in 3DS Max, Maya, Lightwave or any network rendering software? Then let me introduce you to the Twins. A Twin system is a collection of individual computer nodes that share a common chassis for power and cooling to provide exceptionally high computation power in a highly power efficient form. The Twin systems are built primarily for processing. Multiple CPU’s with multiple Cores, backed by plenty of RAM and fast storage makes them the perfect choice for rendering. Are you are currently rendering on your primary workstation, tying it up or slowing it down in the process? Imagine how much more work you could get done if you could off-load that rendering to a dedicated system – or two, or four, or more. 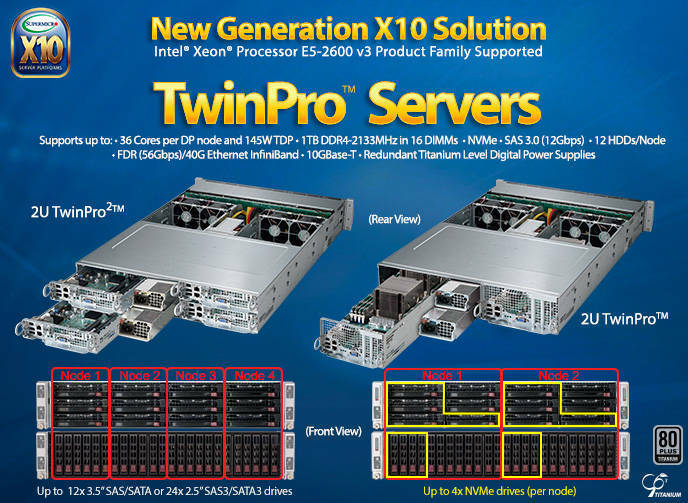 The Twin systems provide a high density computing solution that is ideally suited for use as a one-box render farm. With configurations based on 1U, 2U and 4U these systems house 2, 4 or 8 dual Intel Xeon processors with up to 14 physical processing cores per CPU. That density will give you 224 cores in just 2U of rack space! As each node is a standard dual processor PC they are easily integrated into your existing network infrastructure. Running Windows or Linux and based on Enterprise Class, industry standard Intel hardware these systems are easily maintained and widely supported. Simply install you network render client software and you are ready to go. Supermicro’s patented Twin Architecture is the foundation of the most advanced server platforms in HPC/Data Center, Cloud Computing and Enterprise IT applications. These high performance, high density systems feature optimum airflow for energy efficient cooling, easy maintenance and high availability with hot-swappable nodes and redundant power supply modules. These systems also feature the latest CPU and interconnect technologies with up to 16 DIMMs per node for maximum processing performance and data throughput. 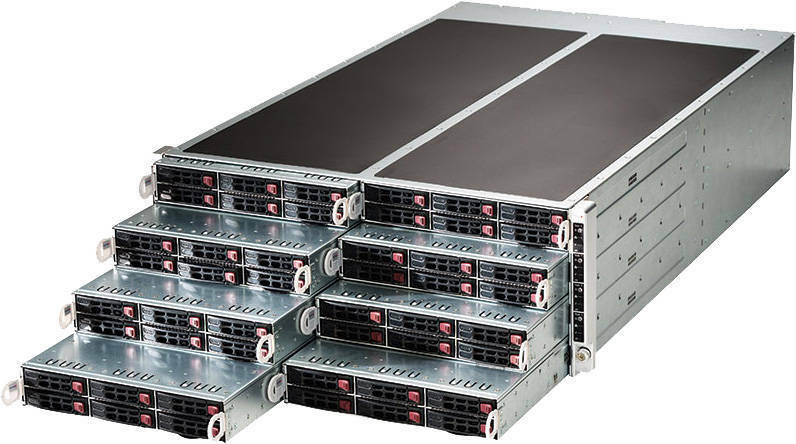 The Supermicro 1U hot-swap dual node 1U TwinPro™ family of SuperServer® systems offers the very best solution for customers who need high compute density with redundancy for high availability applications. With dual DP compute nodes accessing up to 1TB of memory, the system provides the highest levels of performance in a 1U form factor. The 1U TwinPro also offers improved serviceability with compute nodes that are cableless and easy for technical staff to access. These benefits are enhanced with the most advanced networking and storage features, including 1G / 10G Ethernet or 56G InfiniBand, and 4x 2.5″ SAS 3.0 (12Gbps) drive bays per node. Availability is significantly enhanced with redundant high-efficiency Titanium Level compact power supplies. 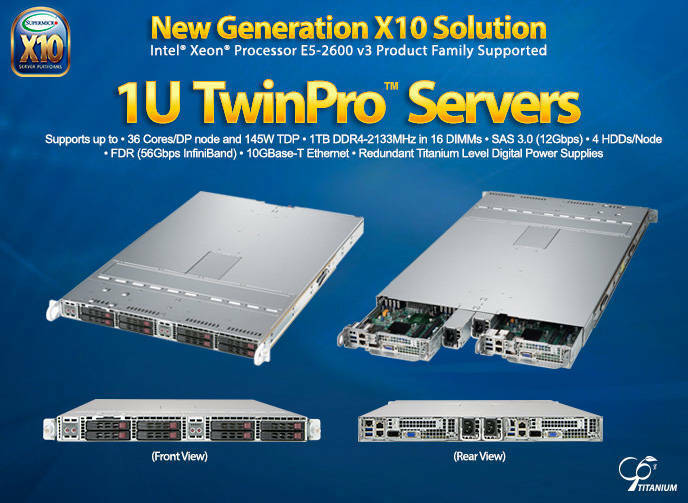 The 1U TwinPro™ systems offer an impressive set of features packed into a 1U form factor, including dual hot-swap nodes and redundant 900W/1000W Titanium Level (96%+) compact power supplies, each node supporting dual Intel® Xeon® E5-2600 v3 processors (up to 145W TDP), up to 1TB ECC DDR4-2133MHz memory in 16 DIMMs, 4 hot-swap 2.5″ HDD/SSD drive bays, 1 PCI-E 3.0 x16 Low-profile slot and 1 “0” slot, dual 1GbE, dual 10GBase-T, or single FDR (56Gb/s) IB or 100GbE options, 1 SATA-DOM, 2 USB 3.0 ports, IPMI 2.0 with dedicated LAN port & KVM; 4-pin PWM Fan Speed Control; and Thermal and Voltage Monitoring. The Supermicro TwinPro™ Solution architecture builds on Supermicro’s proven Twin technology to provide the greatest and highest throughput storage, networking, I/O, memory, and processing capabilities in 2U, allowing customers to further optimize Supermicro solutions to solve their most challenging IT requirements. The Supermicro 2U TwinPro™ and 2U TwinPro2™ provide up to 1TB of DDR4 up to 2133MHz LRDIMM memory in 16 DIMM slots; PCI-E 3.0 x16, PCI-E 3.0 x8 LP (2U TwinPro™), and “0 slot” flexible rear expansion for add-on card solutions such as PCI-E SSD, dual 10GbE with SFP+, or GPU/Xeon Phi; 10GBase-T, InfiniBand, or Gigabit Ethernet networking options; up to 4 NVMe and 8 SAS3 (12Gbps) 2.5″ hot-swap HDDs per node; co-processor support (2U TwinPro™); IPMI 2.0 + KVM with dedicated LAN; SATA DOM power connector; TPM 1.2 header; and redundant Titanium Level power supplies. The Supermicro FatTwin™ represents a revolution in Green Computing designed to support customers’ critical applications and also reduce Data Center TCO to help preserve the environment. 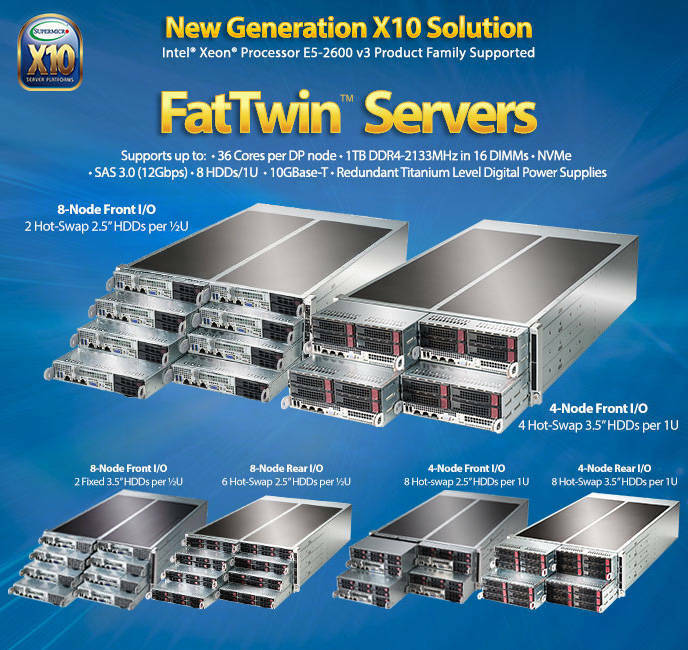 The FatTwin™ extends the compute and storage capabilities of Supermicro’s existing Twin SuperServer® systems to achieve increased performance and power efficiency. Due to its shared components the FatTwin™ improves cost-effectiveness and reliability, while its modular architecture makes it flexible to configure and easy to maintain.